10% off Regular Priced Hanna Home items. 15% off any or Free Shipping on $50+ order. With Hanna Andersson email sign up. Hanna Andersson offers charming, unique, and fun apparel, shoes, pajamas and accessories for the entire family. Use a coupon code to save big on stylish and cheerful clothing, shoes and accessories. You'll always find something you want and need for your wardrobe at Hanna Andersson. Kids have the most colorful personalities. You never know what silly thing they’ll say or fun idea they’ll have. When it’s time to get dressed in the morning, you can help your child celebrate her unique personality with fun clothes from Hanna Andersson. At HannaAndersson.com, you’ll find bright colors and lively prints that will put a smile on anyone’s face. From cozy winter sweaters to playful summer frocks, you can outfit your child for fun-filled days year round. Not only does Hanna Andersson’s clothing look great, it’s crafted with comfort in mind. These clothes are made of high-quality cotton knits, inspired by Swedish children’s clothes. Don’t let the remarkable softness fool you though – they’re made tough enough to keep up with lots of horseplay. The family that dresses together, stays together! Besides heaps of charming children’s clothes, Hanna Andersson also offers apparel for the whole family. Shop the Family Collections for coordinated styles that vary from season to season. Mom should also check out the Match With Me section, where she’ll find comfortable styles that match some of Hanna Andersson’s children’s outfits. In 1983, Hanna Andersson sent out her first children’s clothing catalog. She was inspired by her grandmother, the original Hanna Andersson, who always looked for the best quality and used things for a long time. When Hanna moved to America from Sweden, she was surprised not to find the same quality cotton-knit clothing for babies that she had known back home. Now she’s been sharing high-quality, comfortable Scandinavian children’s wear with Americans for thirty years. Besides keeping your own kids comfy, when you buy Hanna Andersson clothing, you’re also giving back to the community. Through the Hanna Helps program, the company keeps a portion of the profits from every purchase to give back to schools and nonprofits that serve children across the country. Every item you purchase for your child represents a helping hand for a child in need. Next time the sleeves on your children’s sweaters are looking a little short, bring home playful, comfortable clothes from Hanna Andersson. Use a Hanna Andersson coupon code when you shop to get a pint-sized price. Hanna Andersson offers a world of whimsy and charm in the form of colorful children’s clothes. Having doubts or hangups while shopping at HannaAndersson.com? Here are the answers so some common questions. Why won’t my Hanna Andersson coupon code work? The most likely reason is that the coupon has already expired. Take a look at the expiry date and make sure it hasn’t passed already. If this isn’t the case, there may be coupon restrictions that your order isn’t fulfilling. Some promo codes will only work for a minimum order amount or will only work if you purchase certain items. Double check the coupon restrictions to make sure your order meets them. Where do I find out about the coupon restrictions? If you see a small “i” or “information” symbol on the coupon you want to use, this means that restrictions apply to it. Click on the “i” to reveal the restrictions. How do I find the right size clothes for my child? Hanna Andersson uses the European method of sizing. First, you should know your child’s height and weight. Then, find his or her height and weight on this sizing chart. If your child’s weight is more or less than what is listed with his or her height, use just the height to find the right fit. Should I buy a bigger size to allow for shrinkage? No, there's no need to "buy big." Any items that will shrink have extra material added to account for shrinking. When they arrive, they might seem too big, but after one or two wash and dry cycles, they will shrink to the correct size. If you have any questions about how much shrinkage you should expect in a specific item, you should contact customer service. How much is shipping? Is there international shipping? Shipping prices vary based on how much you order and how fast you want to receive your order. You can find a chart of shipping prices here. Hanna Andersson ships to Canada and Japan with shipping choices, as well as any other country by either International Standard Mail or FedEx Express. Read this page for more information on international shipping. 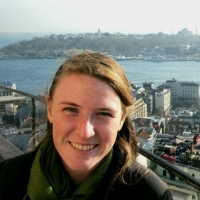 What is Hanna Andersson’s return policy? Hanna Andersson has a simple return policy: If you’re not happy with something you ordered, return it at any time for a refund or replacement. You can use the prepaid shipping label included with your order to mail the item back, and a $6.95 charge will be deducted from your refund. Read the full return policy here. I want to order a gift from Hanna Andersson. Can I get it gift-wrapped? Yes, Hanna Andersson offers signature gift boxes with gift orders. Gift boxes are $5 and notecards with personalized messages are free. You can add these items to your gift order at checkout – just check the box that says “This is a gift” during checkout and follows the prompts. I found a Hanna Andersson deal. Can I share it on your site? Since we want to make sure that every deal we offer at CouponPal.com is valid, we don’t currently allow users to post their own coupons to our site. But we still want to hear from you! If you find some juicy savings, have a suggestion, or want to say hi, feel free to email us at contact@couponpal.com. At HannaAndersson.com, you'll find some of the cutest clothes for kids on the web. You can also get them at prices that are small enough to be cute, too – just follow these instructions to use a Hanna Andersson promo code. 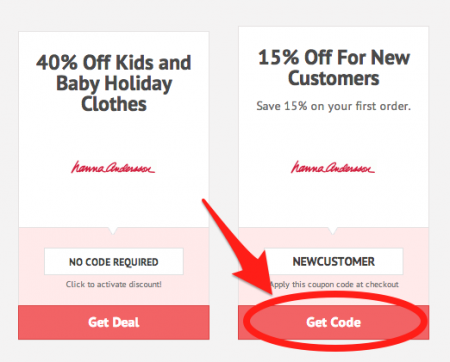 First, find a promo code for Hanna Andersson that you like at CouponPal.com, and click "Get Code" or "Get Deal." Some coupons won't require a code; instead, the discount will be automatically applied when you shop. Others do require a code. 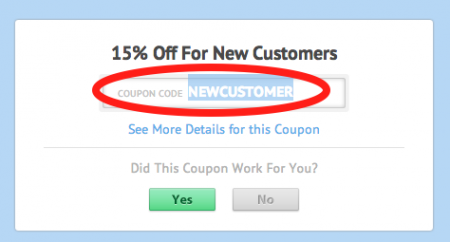 If you choose a promo that requires a code, a window will appear displaying the coupon code. Highlight and copy it so that you can use it at checkout. Now have fun shopping to your heart's content at the Hanna Andersson website. Don't forget to check out the coordinated family collections! When you find something you like, choose a size and add it to your bag. When you're done shopping, click "View Bag" at the top of the page. Take a look at the contents of your bag before proceeding, and make sure that all of the sizes are correct. If you selected a coupon that does not require a code, you should see the discount reflected in the prices of your items. If you chose a coupon that does require a code, now is the time to redeem it. You'll see a box at the bottom left hand side of your shopping bag page that says "Web Code." Paste your Hanna Andersson promo code here and click "Apply Web Code." You should see a message that says your discount will be applied at the end of checkout. After applying the coupon code, click "Begin Checkout." Next you'll have the option to sign in to your account, create an account, or place your order as a guest. Then you'll need to enter your billing and shipping information and review your order once more. Finally, enter your payment information and submit your order.